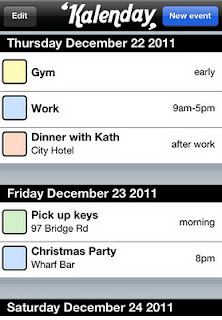 Sydney, Australia - Kalenday, an innovative new calendar app has just been released on the App Store for iPhone and iPod touch devices. In a first for the app store, Kalenday kicks life into the calendar by enabling users to add events with flexible times such as 'after work', 'starts 9pm' and any other text. "Entering times for every event in digital calendars has always frustrated me," says Andrew Varvel, founder of Kalenday. "It was about time that someone built a digital calendar that reflected the flexibility inherent in peoples' lives. As a result, it's the fastest and simplest calendar for iPhone". Kalenday has invited potential customers to visit their website and test their current calendar app against Kalenday on an online video. Kalenday is committed to its vision of the flexible calendar and updates are already planned with more exciting features that will ensure it remains the fastest and simplest calendar app on the App Store. "This is just step one. We're really excited about the future of Kalenday and how we can help our customers kick life back into their calendar. It's all about removing the frustration, the bore and the annoyances of calendars that our customers are so accustomed to, " says Mr. Varvel. Kalenday 1.0 is $1.99 USD (or equivalent amount in other currencies) and available worldwide exclusively through the App Store in the Productivity category. Kalenday is committed to user feedback and encourages customers to interact with Kalenday through email, Facebook and Twitter. Kalenday kicks life into calendars and only makes the fastest, simplest mobile calendar applications that enable users to enter events with flexible times. 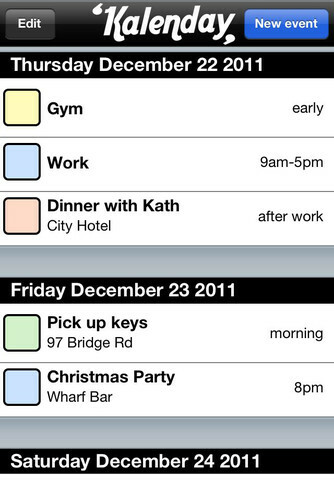 Kalenday for iPhone & iPod touch was released in late 2011 and is the first step in the company's vision of kicking life into the calendar. Copyright (C) 2012 Kalenday. All Rights Reserved. Apple, the Apple logo, iPhone, iPod and iPad are registered trademarks of Apple Inc. in the U.S. and/or other countries.